You know those days you crave your favorite childhood meal? Maybe its spaghetti and meatballs or buttery macaroni and cheese- mine is most definitely Chicken Suzanne. This was a dish my mother used to make all the time growing up because its simple and tasty. It only takes half an hour to whip up, it freezes easily and its a comforting dish for cozy cold nights. The combination of mushrooms, artichokes and cream with tender chicken and crispy almonds is the perfect culmination of delicious ingredients. It’s also a great way to use up some leftover Thanksgiving turkey! Substitute 2 1/2- 3 cups of shredded turkey for the chicken and you’ve got a creative dish for all those leftovers! 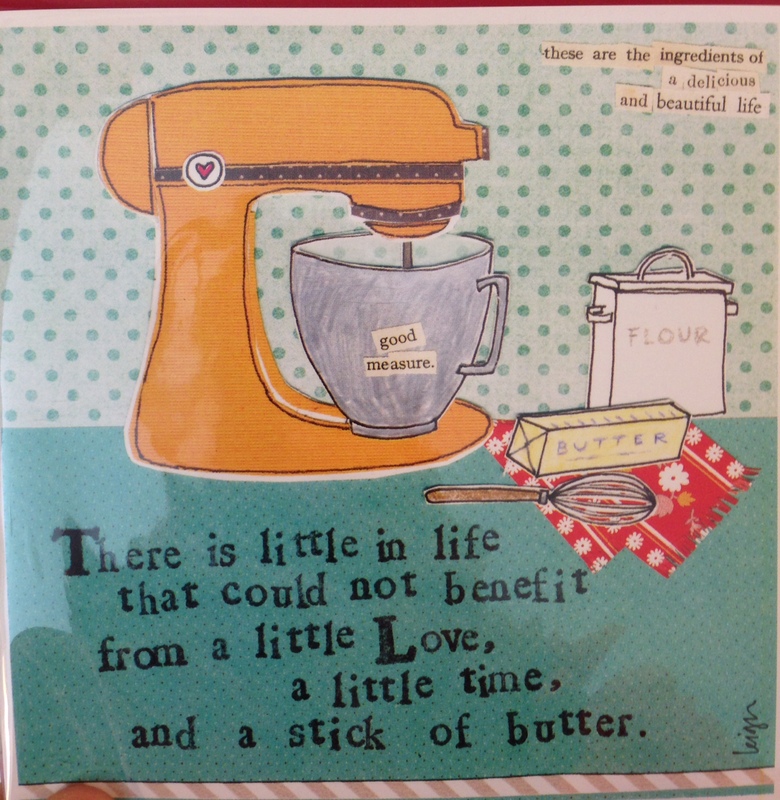 I found this great card shopping over the weekend- I do wish that all life’s problems could be solved with a stick of butter! Sometimes all it takes to turn around a bad day is some classic comfort food to warm your soul and make you feel at home. Serve with a fresh baguette and your favorite glass of red wine! Enjoy! Preheat the oven to 325 degrees. Make rice to package directions. Butter a 4 quart casserole or baking dish. Set aside. Remove the meat from the bones of the rotisserie chicken and cut into pieces. Cut the artichoke hearts into bite size pieces. Combine chicken, rice and artichoke hearts in large bowl. Saute the diced onion in the butter. When the onion becomes transparent, add the flour. Cook for 1 minute over low heat. Add the chicken broth, milk and cream and stir until thickened. The mixture should be the consistency of heavy cream. Stir in the seasonings. combine the completed sauce with the chicken, rice and artichoke mixture. Add the sliced mushrooms. 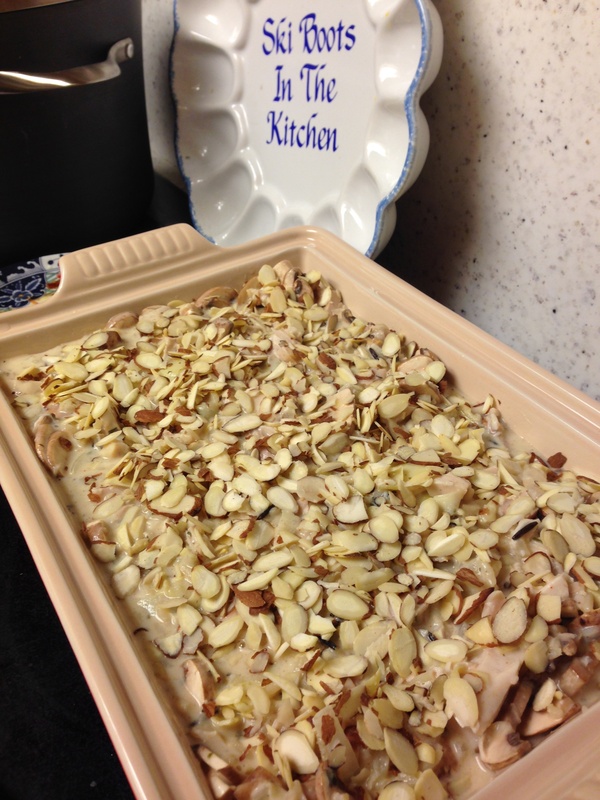 Pour mixture into prepared casserole dish and top with slivered almonds. Bake in the oven for 30 minutes or until hot and bubbly. Can be frozen or made the day before serving. This entry was posted in Family Favorites, PomPom Signature Dish and tagged chicken casserole, Chicken Suzanne, cream chicken, mushroom and artichoke casserole by skibootsinthekitchen. Bookmark the permalink. Chicken Suzanne is a Patterson family ski trip favorite! I forgot about that winner- thanks Perry!! Okemo Mountain ski trips were my favorite! Glad you love this dish as much as I do- its so yummy! !